Ran Xia reviews Jody Christopherson’s genre-bending look at the life of Mary Shelley. Thunderstruck, footsteps in the dark, a questionable spread of tarp covering laboratory appliances… it’s all the basic ingredients of a horror story. With American Horror Story part of the zeitgeist, and the horror genre always reliably popular, our taste buds have long since been primed for ghouls and gore. The electric current pulsates, and there’s Mary Shelley (Jody Christopherson), ready to retell the creation story of her monster. AMP (the title stands for both the scientific measurement of electric current, as well as the acronyms for A Modern Prometheus) unfolds through two narratives. On stage, Mary guides you through a tour of an anatomy theater. Theater: the place where something happens. The word is used as much in hospitals as in the creative field. But here in the theatre of postmortem mystery, spectators do not witness the romance or vengeance created by humans attempting to understand humanity, but something far more primal and tantalizing. You see within the skin and flesh of bodies, and observe a frog’s danse macabre. Mary Shelley tells it all: Luigi Galvani’s experiment (he discovered animal electricity) in 1780 started the fascination. The frog, without a head or a heart, was merely legs attached to the spine. I’ve seen it myself in middle school physics class: as electrodes touch the frog’s spine, its legs twitch, upwards; life seems to return to the wretch in the pure form of motion. Mary Shelley, the perpetual outsider, the April Ludgate of the Byron gang, had been stifled by the series of misfortunes that was her life, and haunted by the very idea of death since infancy. It’s no wonder she was drawn to the phenomenon that was the closest thing to resurrection in the Age of Enlightenment. The mere idea of separating the secret of life from religion, and possibly controlling it with the hands of scientists, must have seemed a marvel. Her motherless childhood, and the loss of her two children, (as well as her husband Percy Bysshe Shelley, but that’s a tragedy yet to come), made Mary a dormant volcano. So in 1816, when Lord Byron challenged his cohorts to writing their own horror stories in Geneva, it set in motion the dawn of a brand new genre of fiction, in which the alchemic reaction between a nightmare of an anatomy table, the phantom cries of her dead children, and the gloom of “the year without a summer,” thanks to the infamous solar eclipse, gave birth to Frankenstein. Its protagonist, the hideous, curious, misunderstood creature was indeed a reflection of Mary’s own experience. A secondary storyline is delivered onscreen, following the story of Anna (also played by Christopherson), an aspiring cellist in 1952 Massachusetts (the height of Electroconvulsive Therapy in America, applied to patients with mental illnesses). The film consists of tapings of psych evaluations, in which Anna answers to a calm and clinical psychiatrist (Finn Kilgore, voiced off screen). A similarly isolated and repressed character, Anna is ultimately driven to violence and certain madness, which seems to serve as a juxtaposition to Mary Shelley. The footage plays intermittently with the narratives onstage, where Anna exhibits traits of someone who would be diagnosed with borderline personality disorder (no actual diagnosis is made during the show). Meanwhile, our 19th century heroine also begins to discover the monster inside herself, which she lets loose in literary form, animated by electricity. Christopherson’s captivating performance gives a palpable intensity to the heroines both onstage and onscreen: Mary is poised, commanding, and increasingly eruptive (as she drinks more and more from a jar of embalming fluid onstage); and Anna begins as nervous, disturbed, and eventually ravenous and volatile. Kudos to Stacey Boggs for the ingenious lighting design that’s at once atmospheric and spellbinding: yhose perfectly timed effects might as well transport you to a real life psych ward, as well as a stormy night in the early 19thcentury. While there are some underlying connections between Mary and Anna, the film unfortunately does not add to the dramatic integrity of the show, but rather makes it confusing. The juxtaposition seems forceful, and if ECT was meant to be a common thread that ties the two narratives together, it wasn’t made evident either, as it never seemed to be a contributing factor to Anna’s mental deterioration. The film’s interview-based nature also makes it as text heavy as its onstage counterpart. I found myself at times struggling to discern the speeches, especially when the audio of the film interfered with the ambience, which I assume was made to seem like a retro, homemade taping. If the juxtaposition of the two was meant to convey a sense of relevance of Mary Shelley’s legacy, a story from the 50s also lacks the immediacy. 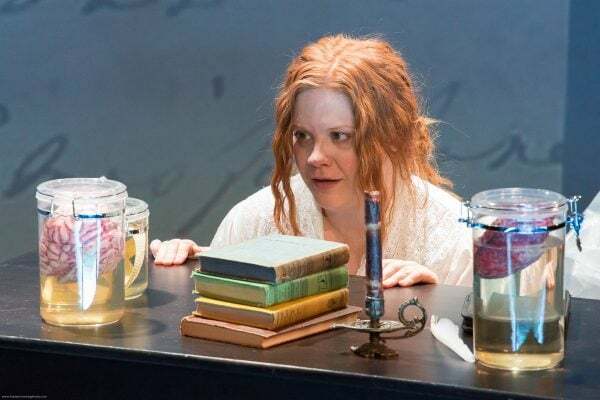 The readily complex story of Mary Shelley’s monster is riddled with historical circumstances, which push the show dangerously towards pedantic. The staged part of the show is also strewn with voice-overs of various characters in Mary’s life, offering contexts of her upbringing and intellectual influences (especially from her feminist pioneer mother). However, while the voice actors (Ryan McCurdy’s Percy, Chloe Dirksen’s Mary Wollstonecraft, J. Stephen Brantley’s Godwin, and Jonathan West’s Byron) adequately represent those peripheral characters within the limited number of quotes, their presence seems superfluous. Besides, their relationships with Mary are more effectively signified through Christopherson’s performance alone. Though impressed by the innovative way AMP blends genres, and its indubitably dazzling technical aspects, I believe that the show would benefit from simplicity. The show attempts to answer the question “how the monster was made” through Mary Shelley’s life. It needs to plot a more defined course, but it is well on its way. AMP runs to December 17, 2017. More production info can be found here.